This elephant completely adorned, ready to carry a high dignitary on its back, began a march forward as suggested by the light breath of the drapery. He looks quietly before him and shakes its ears: this gesture peculiar to elephants helps the animal to regulate its body temperature. This precision tends to stage the elephant, an exotic animal particularly fascinating for the nineteenth century society. 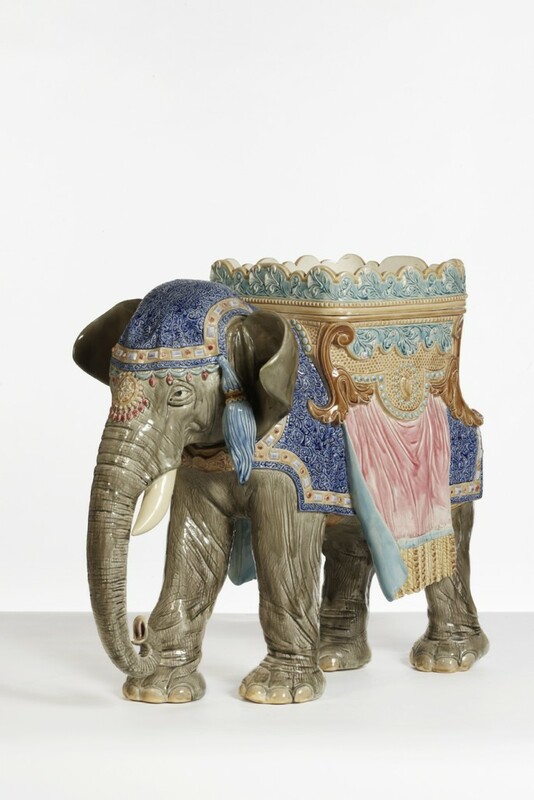 In this brightly colored and realist elephant jardiniere in ceramic, different textures are carefully recreated to play with the various materials: the wrinkled skin of the elephant, the ivory of tusks, the silky fabric drapes and fine embroidery. The seat present on the elephant’s back serves as a receptacle for plants. If this piece is functional, it remains primarily a decorative element. The function is more defined by aesthetics than form. 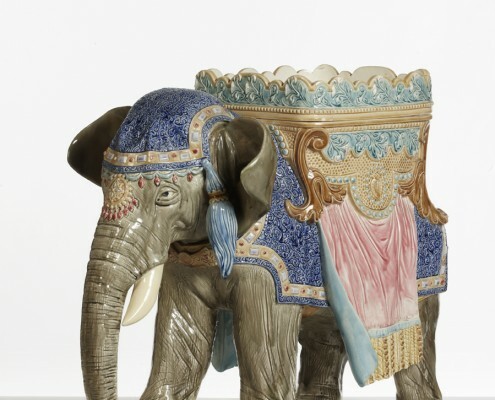 This spectacular work is the result of close collaboration between the modeler-creator of the model Paul Comolera (animal sculptor) – and the potters of Choisy-le-Roi who have clearly reproduced the strength of the elephant and the beautiful colors enhanced by the glaze.